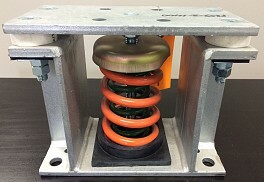 Kinetics Model FLSS Seismic Control Restrained Spring Vibration Isolators consist of free-standing, large diameter, laterally stable steel springs assembled into welded steel housing assemblies. The housings are fabricated to limit vertical movement of the isolated equipment if equipment loads are reduced or if the equipment is subjected to large external forces such as high winds or seismic events. The housings also provide a constant free and operating height to facilitate installation. Spring elements are complete with internal noise isolation pads and leveling bolts as a part of the top load plate assembly. Holes are provided in all isolators for bolting to the structure and the supported equipment. To assure stability, the springs have a lateral spring stiffness greater than 1.2 times the rated vertical stiffness and are designed to provide a minimum overload capacity of 50%. FLSS vibration isolators are available with deflections to 4" (100 mm) and with load capacities to 23,200 lbs. (10523 kg) as standard products. Custom isolators with higher deflection and greater load capabilities are also available. Kinetics Model FLSS Spring Isolators are recommended for the isolation of vibration produced by equipment carrying a large fluid load which may be drained, such as boilers and chillers, and for the isolation of cooling towers, air-cooled condensers, etc., where motion due to wind loads must be minimized. When the mechanical equipment is located above or near noise and vibration sensitive areas. When the mechanical equipment is subjected to seismic events, high wind loads or other external forces. When the equipment to be isolated has significant changes of weight due to fluid drainage during maintenance operations such as boilers, chillers and cooling towers. Operating static deflections are available up to 4" (100 mm) to maintain a high degree of noise and vibration control while compensating for long span flexible floor structures.